Nickname(s): "The Birth Place Of Montana"
The population was 1,464 at the 2010 census. Established by European-Americans Auguste Chouteau and Pierre Chouteau, Jr. of St. Louis in 1846 as the last fur trading post on the Upper Missouri River, the fort became an important economic center. For 30 years, the port attracted steamboats carrying goods, merchants, gold miners and settlers, coming from New Orleans, Memphis, St. Louis, Hannibal, Bismarck, Kansas City, etc. 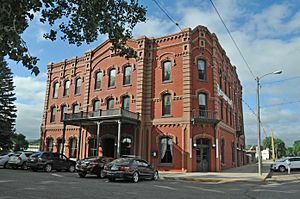 As the terminus for the 642-mile-long Mullan Road, completed by the US Army in 1860, and at the head of navigation of the Missouri River, Fort Benton was part of the overland link between trade on the Missouri and the Columbia River, at Fort Walla Walla, Washington. Twenty thousand migrants used the road in the first year to travel to the Northwest. It became an important route for miners from both directions going into the interior of Idaho, and north to Canada. Steamboat travel to Fort Benton from St. Louis, Missouri helped broadly fuel the development of the American West between 1860 and 1890, when it was supplanted by railroad transport. The river was an important route for miners to the newly discovered gold fields of southern Montana at what became Bannack and Virginia City beginning in 1862, and Helena, beginning in 1865. With the decline of the fur trade, the American Fur Company sold the fort to the US Army in 1865, which named it for Senator Thomas Hart Benton of Missouri. A town had grown up around it that surpassed the military presence. Besides being one of the most important ports on the Missouri-Mississippi river system, Fort Benton was once the "World's Innermost Port". Its importance in trade was superseded by the construction of transcontinental railroads in the late 19th century. In 1867 Fort Benton was the site where Union General Thomas Francis Meagher, then acting governor of Montana Territory, fell overboard from his steamboat and drowned in the river; his body was never recovered. 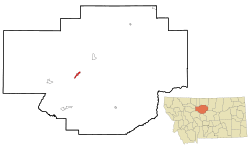 On July 5, 1988 the Fort Benton area was struck by an F3 tornado that injured 2 people. Fort Benton is located at (47.819307, -110.669726). According to the United States Census Bureau, the city has a total area of 2.07 square miles (5.36 km2), all of it land. The community sits in a narrow river valley on the west bank of the Missouri River and is in a geographic area known as the Golden Triangle (one of several dozen folk regions of Montana) due to the strength of the wheat industry of the region. For example, in 2007, Chouteau County was one of two counties in the United States with the highest wheat production. The long summer days (due to being at almost 48 degrees N latitude) and fertile soil of the area (due in part to ash deposits from the Elkhorn Volcanics to the south) leads to exceptionally "hard" wheat (high protein content) thriving in the area. 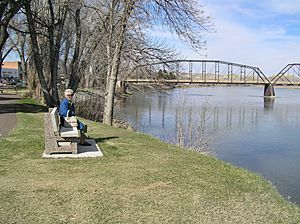 Fort Benton experiences a semi-arid climate (Köppen BSk) with cold, dry winters and hot, wetter summers. As of the census of 2010, there were 1,464 people, 686 households, and 412 families residing in the city. The population density was 707.2 inhabitants per square mile (273.1/km2). There were 811 housing units at an average density of 391.8 per square mile (151.3/km2). The racial makeup of the city was 97.4% White, 0.1% African American, 0.5% Native American, 0.2% Asian, 0.1% from other races, and 1.7% from two or more races. Hispanic or Latino of any race were 0.6% of the population. There were 686 households of which 20.8% had children under the age of 18 living with them, 48.3% were married couples living together, 7.6% had a female householder with no husband present, 4.2% had a male householder with no wife present, and 39.9% were non-families. 37.0% of all households were made up of individuals and 18.6% had someone living alone who was 65 years of age or older. The average household size was 2.08 and the average family size was 2.67. The median age in the city was 52.1 years. 17.6% of residents were under the age of 18; 5.1% were between the ages of 18 and 24; 17% were from 25 to 44; 32.7% were from 45 to 64; and 27.7% were 65 years of age or older. The gender makeup of the city was 47.5% male and 52.5% female. As of the census of 2000, there were 1,594 people, 636 households, and 422 families residing in the city. The population density was 763.2 people per square mile (294.5/km²). There were 731 housing units at an average density of 350.0 per square mile (135.0/km²). The racial makeup of the city was 97.68% White, 0.19% African American, 0.56% Native American, 0.38% Asian, 0.38% from other races, and 0.82% from two or more races. Hispanic or Latino of any race were 0.56% of the population. There were 636 households out of which 30.7% had children under the age of 18 living with them, 54.4% were married couples living together, 9.3% had a female householder with no husband present, and 33.5% were non-families. 31.0% of all households were made up of individuals and 14.5% had someone living alone who was 65 years of age or older. The average household size was 2.34 and the average family size was 2.93. In the city, the population was spread out with 24.8% under the age of 18, 6.2% from 18 to 24, 23.1% from 25 to 44, 22.3% from 45 to 64, and 23.6% who were 65 years of age or older. The median age was 43 years. For every 100 females there were 92.3 males. For every 100 females age 18 and over, there were 84.2 males. The median income for a household in the city was $29,406, and the median income for a family was $32,072. Males had a median income of $22,813 versus $20,787 for females. The per capita income for the city was $14,861. About 11.6% of families and 13.4% of the population were below the poverty line, including 16.6% of those under age 18 and 6.7% of those age 65 or over. Fort Benton, Montana Facts for Kids. Kiddle Encyclopedia.